Play, pause, skip, adjust, record, capture, scroll, flip, turn and control all with one small device. The Digit III from AirTurn is the swiss army knife of remote controls. This versatile Bluetooth remote can connect to your phone, tablet or computer to complete an impressive multitude of functions. The Digit III comes with 5 different modes which assign its 6 buttons with unique commands specific to your device. It also has firmware that can be updated for the possibility of more commands! Anything from biking, performing, practicing, vlogging, reading, photographing or driving can be made easier with the Digit III at your fingertips. Don’t waste time reaching for your device and unlocking it just to turn up your favorite song. Keep focused on your task at hand and use the tactile Digit III to get your groove on, even if your device is in the other room! Play, pause, or skip a song and adjust the volume with this one device. The Digit III can be attached to a keyring or mounted on whatever you please to increase your everyday convenience. Advance slides on your favorite presentation software. Give your best presentation yet by using the Digit III to scroll your slides for you! The Bluetooth 4.0 capability will give you the range to work with the room and be animated with your hands without worrying about the connection. Use with PowerPoint, Google Slides, Prezi, and more with any device of yours! Turn pages or scroll most music, lyric and tab software. Navigate your performance with ease without the audience noticing. The Digit III works with most sheet music, tab, and lyric softwares and keeps your hands on your instrument and not your tablet. The Digit III also has a 150 hour rechargeable battery so you won’t worry about it dying during your solo. Express yourself with selfie and vlog freedom. Capture the moment at any angle by using your Digit III to take your photo for you. Media mode allows your Digit III to take photos and record from any position. Start the vlog channel you’ve always dreamed about; get the perfect framing, and start the show! The Digit III can enable those with disabilities to be in control of their devices. Tasks, like reading from a tablet or listening to music, can now be done with a simple button push from a chair or bed. Are you a DYI recording artist and tired of running back and forth to your computer? Sync the recording mode 5 with your studio software, attach the Digit III to your instrument or Mic and focus on the music and not the tech. Need a special character to trigger an event in an app? With your iPad or iPhone you can customize each button with the commands you need. You can even manage key repeats and response times! Upgrades and customizations are done quickly and easily over Bluetooth. The possibilities of the Digit III are as far reaching as your creativity allows. 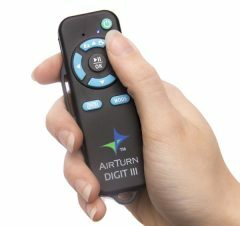 Step into a new world of control with the Digit III remote from AirTurn. Get your own today!